Dr. Michael E. Lueder attended Central Michigan University for his undergraduate education, and then continued on to earn his Doctor of Dental Surgery at the University of Michigan Dental School, in 1975. 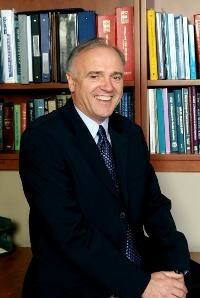 He received his fellowship with the Academy of General Dentistry in 1985. Dr. Lueder maintains membership in the International College of Dentists and the Pierre Fauchard Academy. Dr. Lueder places high priority on continuing education, and seeks to be involved in a variety of opportunities in the dental field. He is a member of the Vedder Crown and Bridge Society, and the Society of Occlusal Studies. He was past president of the Resort District Dental Society, was a former delegate to the Michigan Dental Association, as well as past chairman of the Resort District Peer Review Committee. Born and raised in Reed City, Michigan, Dr. Lueder now resides in Cadillac with his wife Kathryn. They have three grown sons. His hobbies include hunting, skiing, farming and an occasional poker game. Community involvement is important to Dr. Lueder, and he has served as the chairman of the Clam Lake Downtown Development Authority, was past chairman of the Cadillac Teen Center, Wexford County Cancer Society, Cadillac Men’s Club, and the Board of Directors of the Cadillac Area Chamber of Commerce. Dr. Lueder was also chairman of the Missaukee District Library construction committee, past member of the Cadillac Lion’s Club, Wexford County United Way Board, the Cadillac Area Steering Team, and OASIS. Dr. Lueder has membership in Whitetails Unlimited, Ducks Unlimited, Pheasants Forever, the Rocky Mountain Elk Foundation, and Safari Club International. He has also served as the Vice President of the Michigan Conservation Foundation.